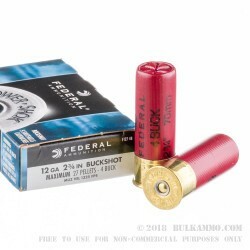 12 Gauge owners in need of self-defense or hunting ammo will be pleased by the performance of Federal Power Shok #4 Buckshot. While 00 Buckshot in a 2-3/4" shell may contain up to 9 pellets, this smaller diameter lead buckshot has 3 times as many pellets. 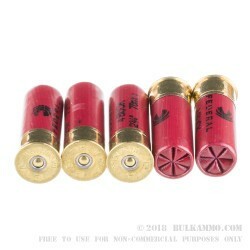 #4 Buckshot is designed for a tremendous amount of damage at close range. 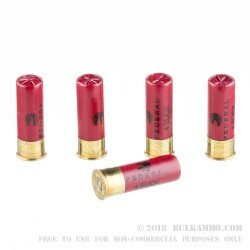 The smaller pellets do not have as much density or range individually as the larger shot sizes, but the muzzle velocity is the same at 1325 feet/second. Federal Power Shok Buckshot uses the Triple Plus wad system. It is available in 00 Buck, 000 Buck, and #4 Buck shot in both 2-3/4" and 3" shell length for 12 gauge. 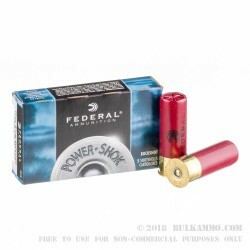 Federal manufactures the Power Shok buckshot in Anoka, MN and is world-renowned for home defense technology and innovation. Q: What weight load isn’t this? I am running a semi auto and need at least 1 ounce. A: Hello Omar, the weight for this shell is 1 1/4 ounce of shot.